We’re a little over two weeks into 2018, and we thought it would be a good time to check in with you and see how you’re doing on your resolutions. One quick Google search and it’s easy to see that the number one New Year’s resolution people make is to become more fit and healthy. It’s no secret that being in good shape affects people in positive ways. The way we feel about ourselves can improve the quality of our lives, relationships, and attitudes. Regular exercise also makes our stomachs growl. Same goes for strategically-placed business logos. Becoming a more organized person is the second most popular New Year’s resolution people make. Time is important and it always seems like there are never enough hours in the day. That’s why we write things down and stick to everything on our lists. Most importantly, we do whatever we can to avoid distractions. Number 3 is live life to the fullest. This is one of our favorite resolutions. If everyone took the time to add Pepperoni and Extreme to their list of favorite words, the world would be a better place. Run, walk, or crawl quickly to any Rascal House (you can also run, walk or crawl “in place” at home should you feel like delivery). If you think it will help, throw a 50-lb weight on your back. Feel the burn. Never give up! Write down everything you feel like eating from Rascal House. Use asterisks and underline everything twice. Leave no menu item unturned. Remember, the organized bird gets the worm! Tell everyone you know that you want to live life to the fullest. Then listen to them when they recommend you try the Pepperoni Extreme. Like Ferris Bueller said, “Life moves pretty fast. If you don’t stop and look around once in a while, you could miss it. Well, it was great catching up with you. Good luck on those resolutions. We’ll see you soon! 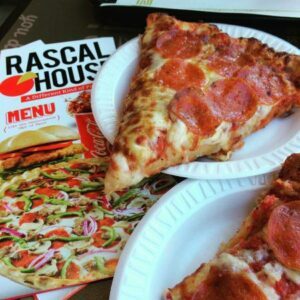 Share how you’re doing on your New Year’s resolutions with us on Twitter or Instagram using the hashtag #RascalHouse, or post on our Facebook page.